Anyway, I felt somewhat better about dining here when I saw the “’New’ Southwest Black Bean Veggie Burger” listed on their menu. Although the staff seemed confused when I asked if it was vegan (“Yes, it’s vegan” – “So there’s no dairy or egg in it?” – “Um, wait, let me check…”), I eventually was able to find out that the black bean patty is vegan, although the bun it is served on contains dairy. It also comes topped with shredded cheddar cheese, unless you request it without, as I did. 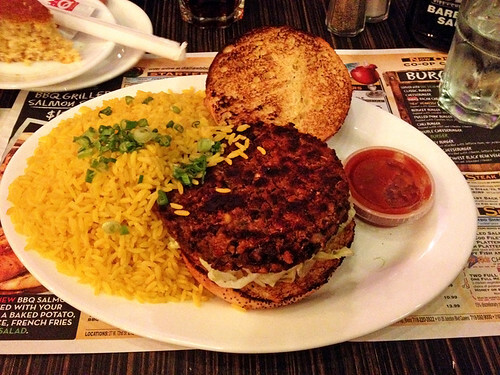 I chose yellow rice as my side dish, and was presented with this huge pile of rice that spilled over onto the burger! The burger came with a little dish of salsa to top it with – which wasn’t a bad idea, but the shredded lettuce beneath the patty was just mediocre iceberg lettuce. 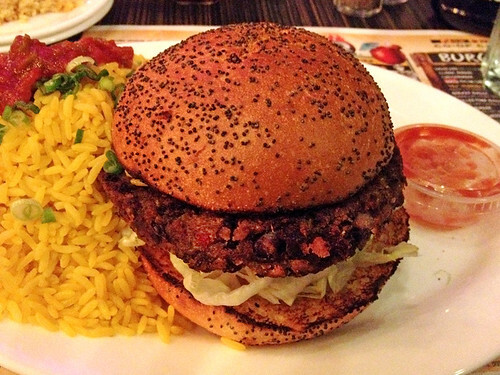 The bun was pretty average – fresh, toasted, and covered in poppy seeds. 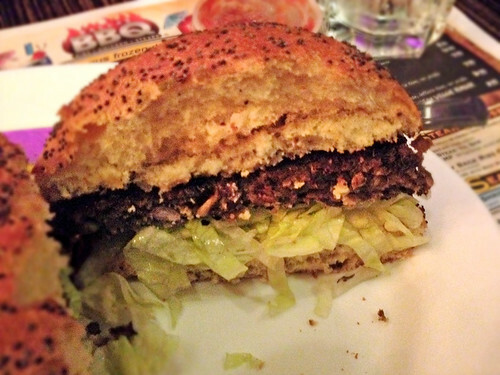 But the patty itself was surprisingly better than I had expected. It was a mixture of beans and corn, possibly with some peppers or other veggies too, and had a nice spicy flavor to it. Crispy on the outside, but a good texture on the inside, it held together well and did not fall apart as I ate it. Probably not made in house, but still much better-tasting than I had anticipated! 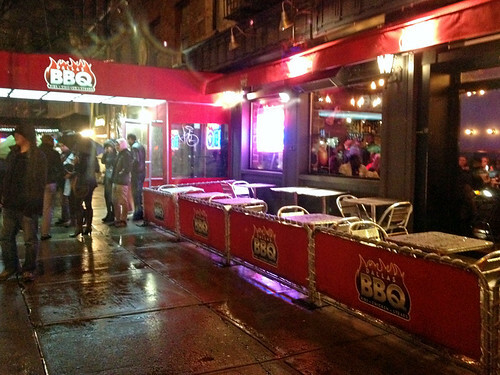 Although I was pleasantly surprised that the burger patty tasted as good as it did, the rest of the restaurant experience was even worse than I had expected – this place is noisy! And we were surrounded by tables of other customers who were literally shouting at each other like it was a wild frat party. Not that I was expecting a fine-dining experience or anything, but I was hoping to be able to eat my meal without being so annoyed by everyone else nearby! I’ll definitely try to avoid ever having to come back to this place, but at least I can happily inform you that if you are a vegetarian and you ever find yourself obliged to eat here, there is a decent veggie burger for you. When people are quick to say something is vegan right after having said it was vegetarian, I imagine that they think I'm some kind of crazy person who has two, interchangeable words for something that has the same meaning. And it never ceases to amaze me how little restaurants- particularly large chains, seem to concern themselves with ingredients/allergens.